In this webinar, the first for 3DMedNet, Robert Wesley (St Louis Children's Hospital; MO, USA) will cover the challenges of running in-hospital 3D printing centers, collaborating with various physician practices and the financial and operational pitfalls and successes. Unfortunately we did not have time to address all of the questions submitted during the live Q&A session. Click here to read Robert's answers offline. The successful implementation of in-hospital 3D printing programs is a collaborative effort of hospital leadership, clinical champions, finance, and business development. Often the programs are ramped up before considering the engineer and how he/she could contribute to the effort. The engineer plays an important role as he/she is the one responsible for the day-to-day operations of the program. Having a clear understanding of the workflow for 3D printing anatomic models and surgical guides is something that the engineer brings to the table and isn’t something the other members of the team are initially aware of. 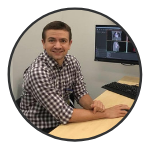 Robert is an experienced biomedical engineer who runs the 3D Printing Center at Washington University Medical Campus (MO, USA), which serves all of the hospitals in the BJC HealthCare network. He works closely with a clinical team to identify anatomy, design and manufacture models, and apply quality standards throughout the process. He has consulted pro bono for southeastern children’s hospitals in ramping up 3D printing programs in their infancy.